Writing from his desk in Red Wing, father Orrin Densmore fretted about the swelling size of Robert E. Lee's army. He feared that Benjamin's regiment might feel the "intensified hatred and cruelty of rebel demons." In the field, Benjamin and Daniel Densmore grew cynical about the corruption, incompetence and prejudice they saw in the Union army. White soldiers blanched at the perceived indignity of fighting alongside blacks, so most black troops were limited to performing manual labor. Early in the war, black fighters got paid less than their white counterparts. Black troops were often issued the worst materiel that the Union quartermaster had to offer. The Confederacy surrendered in April, 1865. Benjamin and Daniel Densmore served well into 1866. During Reconstruction, the army had to figure out what to do with more than 186,000 colored troops who were trained to dig trenches and fire rifles, but who were not prepared for post-war freedoms. Writing home one month after Lee's surrender at Appomattox, Benjamin Densmore asked if his family knew of anyone qualified to teach his troops basic reading and writing. The money would come from the soldiers' pay. Densmore had already used $16 found in a dead soldier's coat to buy alphabet cards, pencils and tablets for his men. 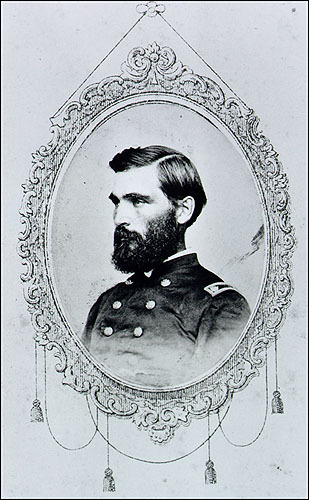 It's unclear whether Captain Benjamin Densmore found a teacher before receiving his honorable discharge from the 4th Colored Heavy Artillery in February, 1866. After the war, Benjamin Densmore and most other Americans quickly set about building a post-war life. The Densmore brothers returned to Red Wing and bought a foundry. The Red Wing Iron Works building still stands near the Mississippi in downtown Red Wing. Benjamin married Sarah Adalaide Greenland of Red Wing and moved into a remodeled schoolhouse, where all four of their children were born. Twenty-six years later, Densmore was prosperous enough to send his children to college and to build a comfortable house on the corner of Third and Fulton Streets. After 46 years at the foundry, Benjamin and Daniel Densmore retired. Benjamin died of pneumonia in January 1913. Daniel and his wife retired to California, where he died in 1915. Part 1: Frances' Father and Uncle Enlist for the Union; Command "Colored Troops"
11. Dyer, Frederick. A Compendium of the War of Rebellion (Des Moines: Dyer Publishing, 1908) 1734. 12. Litwack, Leon. Been in the Storm So Long, (New York: Vintage, 1979) 88. 13. Been in the Storm so Long, 90; BD to DD, 15 April, 1864; DD to "Friends at Home," 3 June 1864.